We didn't return to the hotel until nearly 2am. Exhausted and filthy we both fumbled around, showered and tried to sleep. The gunk in my lungs rattled around and my legs ached and twitched uncontrollably for the better part of our horizontal time. The morning (nearly noon) was hectic with me not being able to move very quickly, neither of us very coherent and needing to pack up before the awards ceremony for our evening flight, all in less than an hour. Starving and still buzzing from our shared experience we did our best to fit our explosion back into our suitcases and meet everyone for lunch on-time. The aftermath of winning Gaoligong hit me in waves. Much like the ocean on a stormy day builds, crests, crashes and retreats, I felt the emotions of this race win. Wave: The finish line also the location of the awards. The magnitude of the awards ceremony was huge. Ushered around in different directions. Photos. So many photos. Making a Golden foot impression for a future path of champions. Announcers. Video clips and montages from the three different race distances were projected and amplified for hundreds to see & hear. Massive trophies. Loads of sponsor prizes. Photos. So many photos. Such a great celebration of everyone’s accomplishments. Honoring all finishers, calling out the top 8 men and women and all age groups. Wave: Just before the rush of the awards, while sitting in a chair staring the trophies in the face, I felt a tap on my shoulder. I turned around to a friendly face and in an instant realized it was my trail buddy, Shi. All we could exchange was hand gestures of gratitude, a hug over the fence and a final high five. I insisted on a selfie and felt so lucky to get to say congrats to the soul that saw me through those dark miles. Wave: Receiving the trophy from Michele Poletti, the founder of UTMB and the man that ran through the night with me in 2003 when I won the first edition. It hit me deep that 15 years later I was at their first international edition. 15 years! In 2003 I won the first UTMB event. 15 years later I won their first international event. To unintentionally be in both of those locations for these inaugural events, fit and ready to run hard, and win. To win the first at 25 years old and the second at 40. My thoughts of 40 then and what I think of 40 now. Another story to write someday but a life point that hit hard on this trip. Wave: Late travel back to Beijing. A day to regroup and celebrate with Vasque distributor friends. Travel back to Seattle and hit the ground running. We arrived in Seattle Tuesday morning after an all-night flight. After 11 days together pretty much 24/7 it was hard to say goodbye and jump back into our respective worlds that were both rolling at high speeds. We did our best… I drove straight to my condo to check in with the PD pup! I missed that little girl. After a quick walk and tug with toys I had to hobble up the hill for lunch with my parents and Doug McKeever in downtown Fairhaven. Luckily everything is really close. Our intention was to meet to talk final logistics in the week leading up to Chuckanut, but ultimately lunch was about helping me land and ground myself by sharing stories and photos from our awesome adventure. I managed grocery store stops for myself and for a lot of the aid stations goods before returning home, unpacking, starting laundry and crashing. The next 3 days were a massive build towards Chuckanut. Ironically each morning I woke at exactly 4:27am. Jetlag. But then my brain would kick in to high gear thinking through all that needed to be done prior to the race. It turns out you can get a heck of a lot done before 8am. With 15 years of experience Race Directing a lot of the to do list feels like pressing play on a movie. Everyone knows what needs to be done and with extra eyes on the project I was confident it would all come together. We didn’t have smoke bombs and laser lights like I experienced in China (future planning? ), but was definitely one of our best events to date. Every year we wonder about, plan our best and do silly dances in hopes of having beautiful weather to show off the beauty of Bellingham to the participants at the race. We plan every detail each year, yet, we cannot plan the weather - the one thing that makes a significant difference on the outcome and overall feel of the day. It is March in the PNW and we hold the race the third weekend of the month intentionally, to give our runners a true Chuckanut experience. More years than not we end up peering out from under rain jacket hoods and burning extra calories trying to stay warm enduring the length of the day. I know we would have figured it out had we had a typical year. My 100-mile tired body would have had to rally just a little more. But I am soooo thankful that this year’s event was gifted that beautiful day. We didn’t shiver through the hours. We enjoyed perfect running weather, and it was just warm enough for all of the volunteers, crews and fans to get out on a sunny Bellingham day. The finish line was full of community members, friends, crews, runners. People hung out, enjoyed the food trucks and even stretched out on the grass (which last year was a mud pit). Fast times by the front runners in both mens and womens fields and a very strong finish field (not that many DNFs). I heard so many great stories from our creative aid stations and enjoyed hearing about the special touches that everyone brings to the race weekend. At our award’s ceremony I was too emotional to put lips to the mic, but I enjoyed working with our team to acknowledge the performances that day. Finish line clean up happened before I could blink. To say the day went by in a blur would not be an exaggeration from this RDs viewpoint this year. At our post-race party hosted by Wander Brewing I did pull it together to thank coRDs Kevin and Tyler and our community. In my many years living in locations anywhere but Bellingham I have always loved how Bellingham owns the Chuckanut 50k. 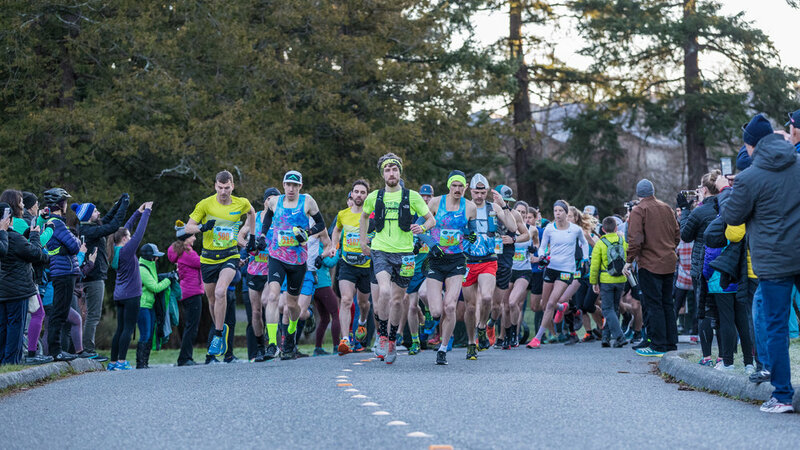 There are countless happenings out on the course and around the event that I will never know about, but are special bonuses that make the Chuckanut 50k unique, classic and renowned in both our local community and in the ultra-community. This year was a test of that ownership, I really only had half a brain to manage the event, but everyone stepped up. Everyone stepped in. Setting a big goal motivates those around you. Adding China prior to Chuckanut was ridiculous but great because of the rally of support that happens to make it so. I didn’t take on that double alone. Now that we are one month post Gaoligong I remain in awe of how well March unfolded. The China - Chuckanut double executed perfectly, better than I could have imagined, hoped or planned for. I work my tail off to plan things well, and I also know it takes equal measures of luck and support to have details play out perfectly. Because of this I am extremely grateful, and sit in marvel of what is possible.